So this tall drink of water, A.S.S., is coming to visit this weekend, along with her hubby. 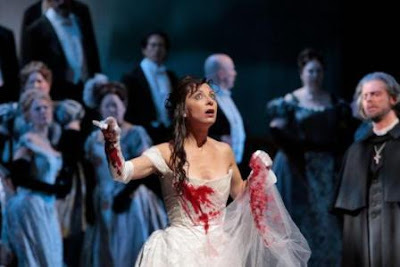 We are going to the Opera for Lucia Di Lammermoor about a murderous Scottish princess (very appropriate as A.S.S's mother is a Scot). After snu snu-ing in up at the Opera, our noses might be so high in the air that we will not be able to walk right. So Saturday night to get back down to an acceptable East Tennessee level of Appalachian American-ness, we will be hitting up an Ice Bears game. Hey there fellas! I adore minor league hockey games! Here, especially after the end of football season, there's a lot of excess (mostly male) energy floating around. Screaming at fighting hockey players is the perfect outlet, no? That consuming copious amounts of booze. Have y'all been to a minor league hockey game or the Opera? Both super fun in, um, different ways. There's definitely going to be a detox next week, so I can fit into that pretty blue dress nex Friday. I'll announce the My New Orleans winner tomorrow- I loved hearing your stories about NOLA, including the ones involving me stepping on Tron's face, or falling off a curb (into a GANGSTER'S car) due to the deliciousness of my shrimp/oyster po-boy from the Verdi Mart. Good times. I used to leave across the street from the arena where the Florida Everblades played (East Coast Hockey League). It was so fun to go to their games, small so it was easy to get in and out but also really entertaining and cheap! Are you sure thats not Lady Gaga? ;) I LOVE hockey games! SO FUN!! I'm a big fan of minor league baseball games. So much fun. Love the ying and yang of the opera and hockey! Sounds like a lot of fun!!!!!!! Fun!! Sounds like a GREAT weekend on the way!! I've only been to Thrashers games and never to the Opera! (unless you count the club in Atlanta named Opera... which, I feel certain, is far from the actual opera). That sounds like a lot of fun! (And can I just say that your legs look great in that white skirt?) Have fun!